When you find yourself at Bergstrom International Airport, Austin, Texas and your flight’s been delayed; and you’ve managed to wangle your way into American Airlines’ Admiral’s Club, you’ve got to use your drink vouchers wisely. I can think of no fairer exchange than a piece of printed paper for a bottle of Stash IPA. 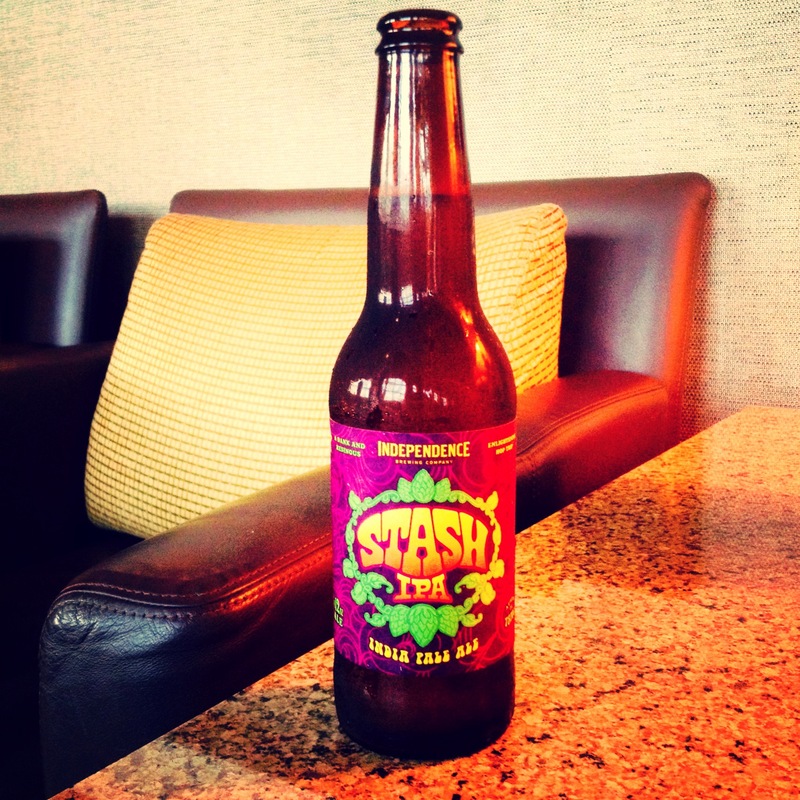 Brewed by Austin’s own Independence Brewing Co, Stash is billed as ‘dank and resinous’. From that description, you might expect it to taste like bong water! Instead, what you get is a punchy American-style IPA packed with taste and aroma. At 7% ABV it’s a heady experience, rolling with citrus, pine sap and exotic resin flavours. Stash IPA comes highly recommended, see your local dealer today and smash one with a buddy! 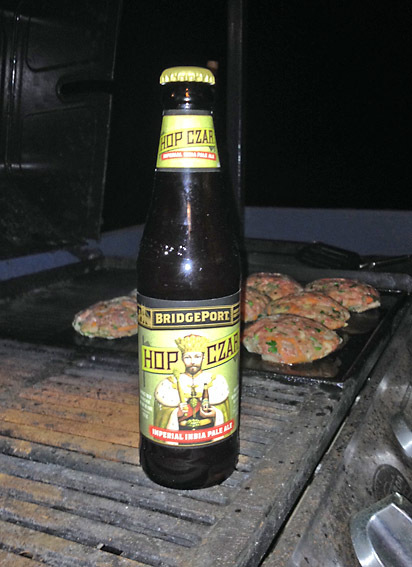 Portland-based Bridgeport Brewing is celebrating 30 years of ‘Beervana’. The Oregon brewers have a fine stable of brews but this is the first I’ve come across. 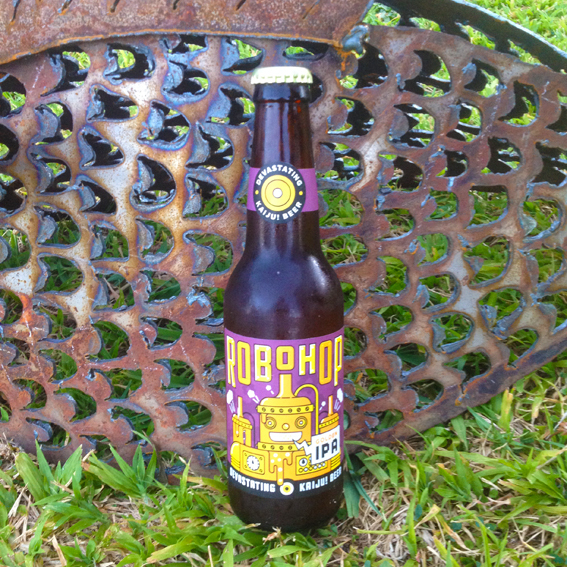 With most American IPA’s the “I” stands for “Intense” and Hop Czar is no exception. 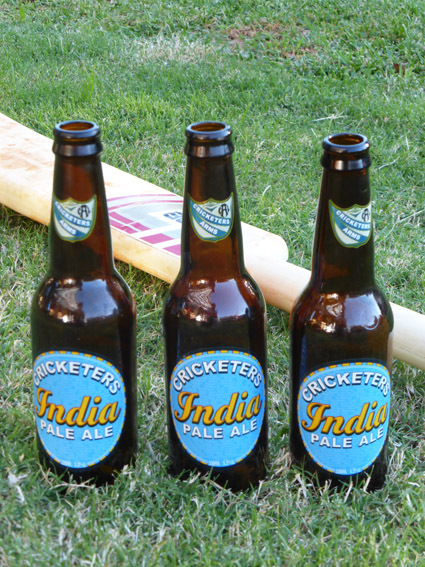 This is a new brew from the Cricketers stable, recently acquired by the Asahi brewing giant. The big brewers are catching onto the craft brewing revolution and want a piece of the action. If it improves the overall quality of available beers, then I’m all for it ….. as long as they don’t masquerade as true craft beers (see Liquorland’s ‘Gold Digger’). This is a pleasant enough beer but it lacks the bite of a real IPA, the ‘I’ bit is missing. Instead you have a fruity pale ale with undertones of lychee, but not enough hopping to give it the bitter finish one associates with an IPA. I wasn’t quite bowled over and score it middle and leg. Here’s Paul Kelly with the legendary ‘Bradman’ ……..
I’ve come to expect a lot from American pale ales and IPA’s and certainly wasn’t disappointed with this one from the Rochester, NY-based Dundee Brewery. Dundee IPA ….. like a Dundee cake put in blender and mixed with beer .. beautiful! 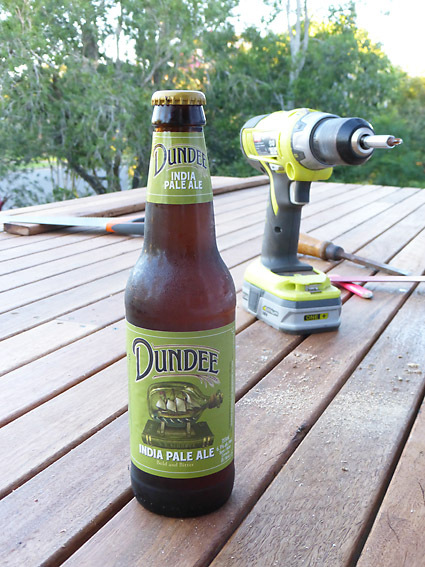 After a hard day replacing the front deck, this IPA went down a treat. Such complexity in the flavours, dried fruit and caramelised sugars mixed with a subtle bitterness with a hint of malt whisky (or perhaps that was the 6% abv coming through). In fact, it reminded me of a Dundee Cake, whether this was psychosomatic because of the name, I don’t know, but I certainly wanted another slice when I’d finished the first. Have your cake …… and eat it. Fremantle’s Little Creatures Brewery have added to their stable of great beers with a beefed-up IPA that’s up there with the best. An American style India Pale Ale, packed with hops and citrus flavours. 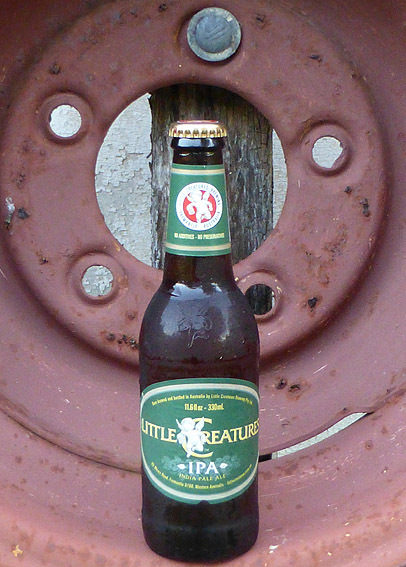 Little Creatures IPA …. big on taste. After the disappointment of Roger’s Beer, it was good to see the West Australians back on form. It’s an IPA with real bite, pleasant pink grapefruit undertones and a great bitter finish. As Jim Carey once said, ‘I like it a lot’. How come I couldn’t find this when I was in Perth? Perhaps the Sleeping Giant was sleeping. This beer is a a bit of well kept secret, like it’s sister Gage Roads beer, ‘Atomic Pale Ale’, I rate it very highly. I bought this as my weekend 6-pack (yes, some days I have more than one beer), and this 6-pack packs a punch. When you wake the giant, you find a crisp dark amber ale full of zing and bite. Grapefruit and Saville Orange rind undertones provide a lip-smacking finish to a full-bodied IPA. An ideal Friday night beer (once you’ve opened a 6-pack, you have to drink the lot, otherwise it goes flat). Weighing in at a hefty 5.4%, this IPA is not for alcopops fans or non Yorkie eaters. I like it a lot. Here’s Tame Impala playing ‘Elephant’ to 100,000 cider-drinkers at Glastonbury ……..
Be careful what you wish for. Two days of wishy washy lager had lulled me into a false sense of security and so I wasn’t ready for the ‘slap-in-the-face-with-a-wet-fish taste of the ‘Big Eye’. 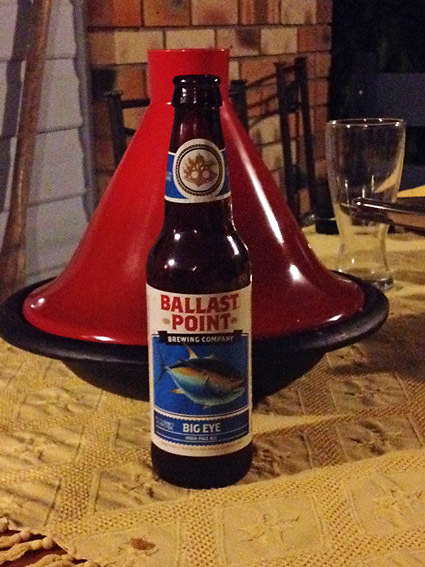 This IPA certainly put the ‘balls’ in Ballast Point. None of your stone fruit here, just pure citrus rind and pith. Bitter with hint of burnt toffee and sea salt, it has real bite and was perfectly matched with the Moroccan chicken tagine I knocked up, with preserved lemons. After a bit of research I find, “Ballast Point is the result of Jack White and Yuseff Churney following their dream of high quality, craft beers. Handcrafted and bottled in San Diego, California , the Big Eye India Pale Ale is a beer for those who love their beers with high hop content. High in natural bitterness courtesy of the American Columbus and Centennial hops, the Big Eye is a perfect accompaniment to a whole range of spicy foods.” (http://danmurphys.com.au/product/DM_721628/ballast-point-big-eye-india-pale-ale) “Big Eye has an IBU (International Bitterness Units) value of 85, which is high for American-Style India Pale Ale beers, meaning it is bitter for its style” (http://beer.findthebest.com). At a whopping 7%, it’s not for the faint-hearted or dyed-in-the-wool lager drinkers Big Eye is quite a catch, hook one today. 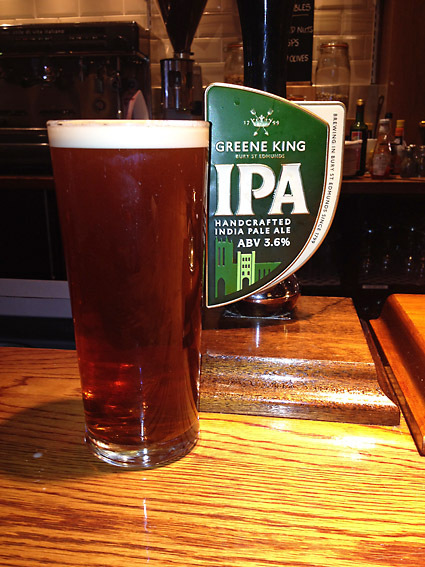 Rumour has it that Bury St Edmunds-brewed, Greene King IPA used to the most popular keg beer in the UK. I say ‘used to‘ because the same unconfirmed source told me it has recently been overtaken by that ubiquitous Cornish/Canadian brew, Sharp,s Doom Bar. It’s easy to see why this is such a popular ale as it choses a middle path and is unlikely to put anyone off. More malty and less fruity than your average IPA, Greene King’s flagship brew slides down very easily. Greene King IPA …… no longer king of the hill? A testament to its popularity is the fact you can get it hand-pumped at Heathrow Airport ….. who’d have thought? At 3.6% it makes for a good session beer and also made a good companion for a steak pie, with mash and peas. I found the taste became more complex as the beer warmed. I could have quite easily had another one ….. but I’m only supposed to have one beer a day. From the album ‘Green’, here’s REM with ‘Orange Crush’ ……. Another day, another St Austell brew, life can’t be bad. Proper Job is a new one for me, though the expression, ‘Proper Job’ is a familiar Cornish saying, meaning “right on”, “ansum” or “boodi”. 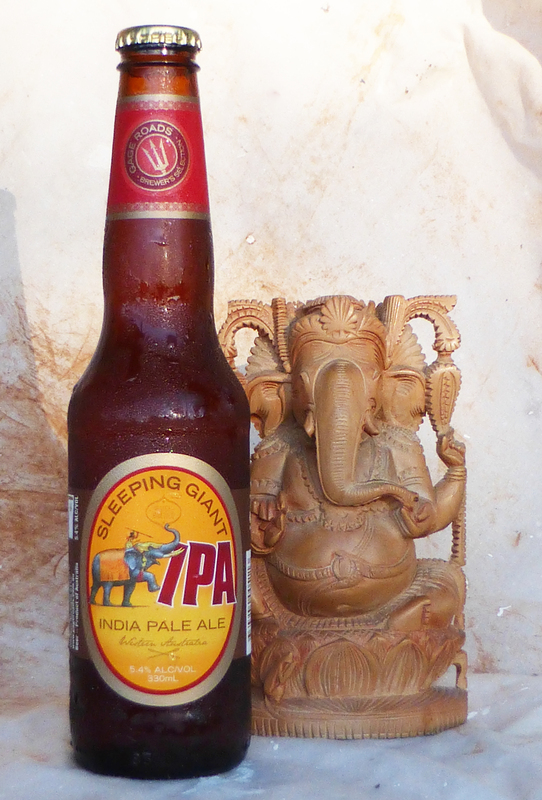 Traditionally, India Pale Ales were brewed for export to British India, slightly stronger than a pale ale and more strongly hopped. 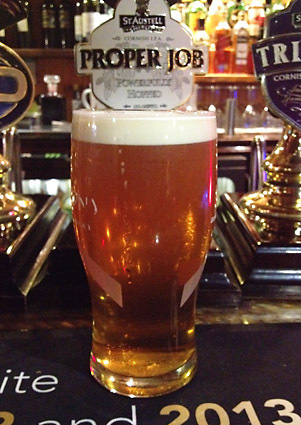 ‘Proper Job’ follows this tradition with a abv of 4.5%, citrus overtones and and a nice bitter finish.